for grades K-12 at a price you choose! One of the services we offer is free customized homeschool curriculum development. By this we mean...If you call us, we will develop a complete curriculum package over the phone for you. 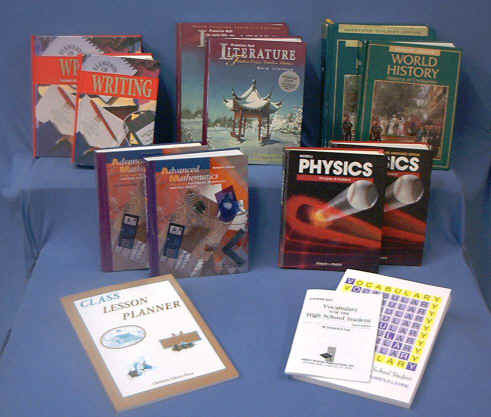 Our complete curriculum packages consist of 5 or more subjects, depending on the grade. A wide variety of products, either new or used, from over 100 publishers will be used to develop your customized order. This process requires a phone call to discuss the specific needs of your student(s) and help you determine your options. Once your needs are established, your order will be carefully gathered and verified with you before it is shipped. The average price range of a complete curriculum with student textbooks and teacher materials is usually around $375 to $575 for a full year's curriculum, depending on the grade. The price you pay is up to you! If you have questions or are ready to place your order call: 252 244 0728. This is the easy one! Just choose from the 4 package choices provided for Grades 1 through 12. Yes, you may substitute subjects. (For Kindergarten curriculum, choose Option # 1). Even though these are considered "pre-packaged kits", we still customize each package so that we are sure it is perfect for your child. If you have questions or are ready to place your order call 252 244 0728. Be sure to include your phone number so that we can call you to ask questions about your child's specific needs.